GB have been grouped with Olympic Silver medallists Australia and European champions Russia for the group stages of the women’s tournament, so expect a tough on-court battle from start to finish. Venue: Basketball Arena, Olympic Park and North Greenwich Arena. GB’s Jo Leedham and team captain Julie Page have shone on court in recent years, with Leedham the star forward who averaged 12 points per game in last year’s EuroBasket. Olympic rivalry: Reigning world and Olympic champions USA will be the team to beat. 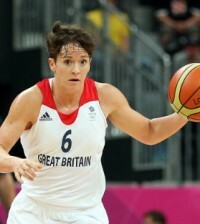 The London 2012 basketball competition will see an incredible 600 basketballs used.